A trip down the beach is usually a good source of ideas for my sketchbook and here are two pages I did. 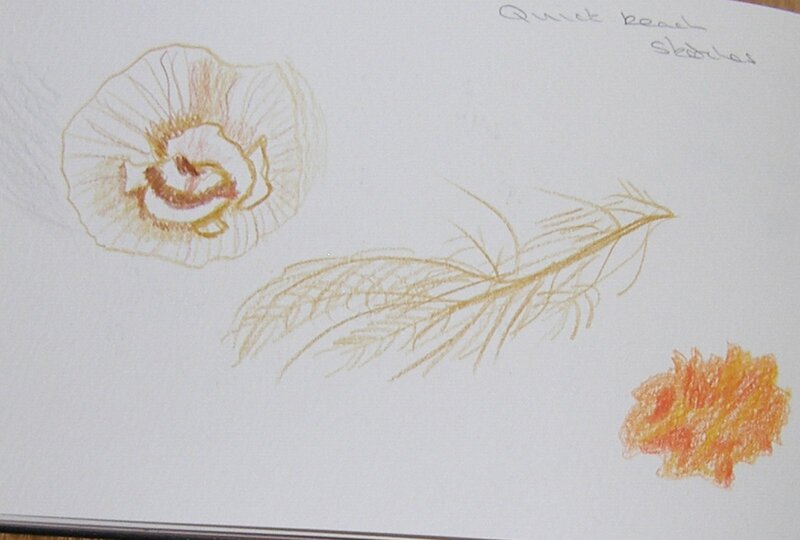 First some quick sketches in coloured pencil of an amazing rose/cabbage shaped piece of coral that washed up after Cyclone Olwyn, a piece of branch like coral an orangy brown colour and a sort of spongey bright orange coral. While it is a shame to see these broken off and washed up it is a rare opportunity to see them in the dry. At low tide the sea leaves shallow channels in the sand and I thought the shapes produced were really interesting, with lots of different depths and contours. They are like tree roots reaching into the ground. It’s quite interesting that after a few weeks I am finding new interests all over the place. I saved this take-away coffee cup as I liked the leaf design. For my drawing I painted a background using coffee, and then painted leaves on top. I deliberately smudged over the top to soften the edges of the leaves. One leaf is too big and throws the balance of the design out but I feel this has potential in a combination of stitch and fabric collage. 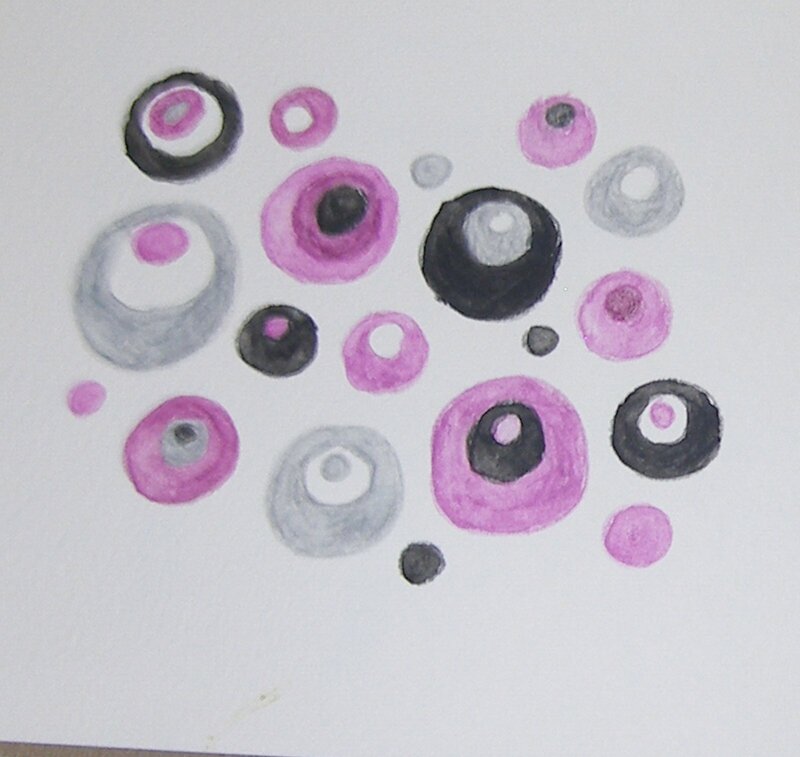 Here are some circles done in watercolour pencil and then wetted with a paint brush. I like the combination of colours here, with the silver and black offsetting the purples. I can visualise the silver and black combination working well with blues, greens and reds as well. 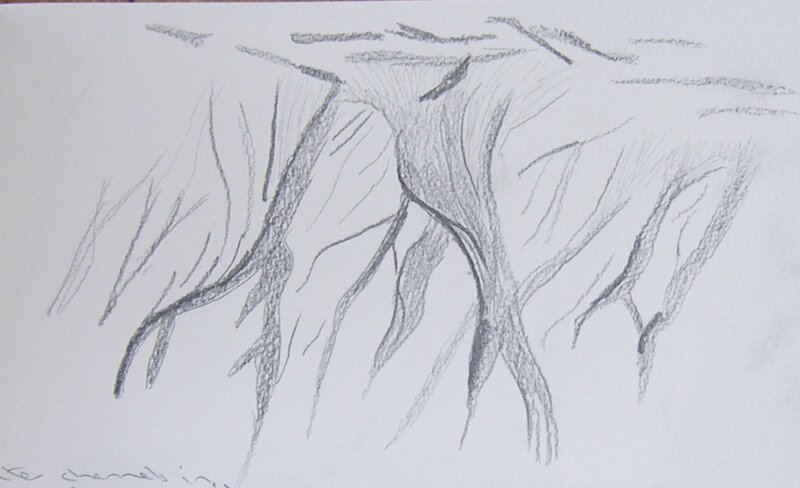 The basic idea here could be used in all sorts of shapes – squares, teardrops, triangles etc.